Top Rated Local® is pleased to announce that Total Clean Carpet Care is an award winner for carpet cleaners in 2019. We highly recommend checking out Total Clean Carpet Care the next time you need trusty and quality carpet cleaners! Total Clean Carpet Care has received many overwhelmingly positive reviews across three different verified sites with an average rating of 5.00 stars, earning them an impressive Rating Score™ of 96.00 and a 2019 Top Rated Local award for ranking as one of the top 10 carpet cleaners in North Carolina! “If 10 stars was an option, I would definitely give it to Total Clean. I can’t express how pleased I am with the results of my carpet, as well as with the exceptional customer service I received. My tech came in, listened to my concerns, explained what he could do for me (versus what he could not, as most companies do) and got right to work. He was done with five rooms and the stairs within an hour. My carpet looks great, and the house smells incredible! They came highly recommended by a friend. I have definitely found who will be caring for my carpets going forward! !” – L.M. It is because of excellent reviews like this that Total Clean Carpet Care is now able to call themselves a Top Rated Local award winner! We were excited to learn all about how Total Clean Carpet Care has been able to build such an impressive reputation, so we sat down with the Manager, Richard Gillis. The first thing we wanted to know was what it is that makes Total Clean Carpet Care stand apart from their local competitors. Richard told us that they are a family business, and that they send owner-operators to every job. This, paired with the quality work they provide, helps them to stand out from the rest. Congratulations to Total Clean Carpet Care for being a 2019 Top Rated Local award winner, and special thanks to Richard for taking the time to speak with us! Top Rated Local® is pleased to announce that ServiceKnight is an award winner for carpet cleaners in 2019. If you are looking for a family-owned company that will bring new life to your floors, look no further than this award-winner! 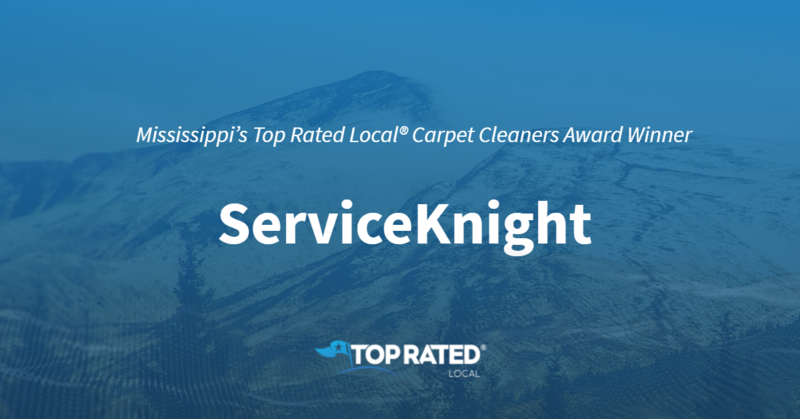 ServiceKnight has received many overwhelmingly positive reviews with an average rating of 4.90 stars, earning them an impressive Rating Score™ of 91.00 and a 2019 Top Rated Local award for ranking as one of the top 10 carpet cleaners in Mississippi! “Our brick floors look brand new! Service Knight was able to take 20-years of grime off [of them]. They were diligent in cleaning, professional, and friendly. They also cleaned our neutral rug and ottoman, which looks brand new as well. Our new year is off to a clean start! We will be using them again!” – A.J. It is because of excellent reviews like this that ServiceKnight is now able to call themselves a Top Rated Local award winner! We were excited to learn all about how ServiceKnight has been able to build such an impressive reputation, so we sat down with the owner, Lee Ryals. ServiceKnight has managed to build an impressive online reputation. We wanted to know more about how this small family-owned business was able to market themselves over the years. 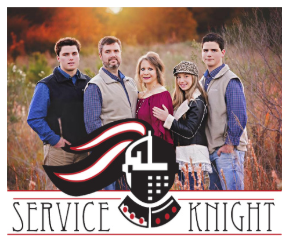 Congratulations to ServiceKnight for being a 2019 Top Rated Local award winner, and special thanks to Lee for taking the time to speak with us! 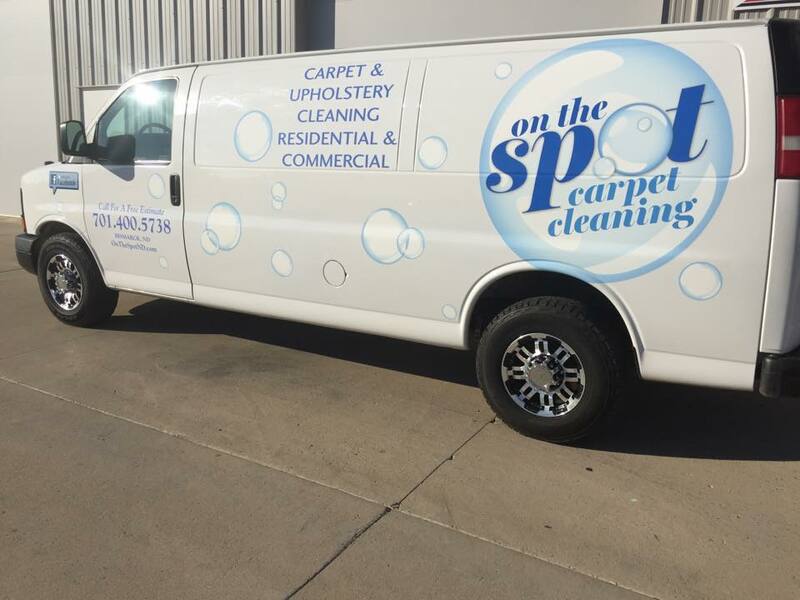 Top Rated Local® is pleased to announce that On the Spot Carpet & Upholstery Cleaning is a 2019 award winner for carpet cleaners in North Dakota! Looking for professional carpet cleaning in Bismarck? If so, look no further than On the Spot Carpet & Upholstery Cleaning. On the Spot Carpet & Upholstery Cleaning has received more than 100 reviews on multiple verified sites with an average rating of 4.96 stars, earning them a spectacular Rating Score™ of 93.56 and a 2019 Top Rated Local award for ranking among the top 10 carpet cleaners in all of North Dakota! “I have had another company come in the past to clean my carpets. They were in and out of my house in less than half an hour. Brian came in cleaned thoroughly and efficiently to get the whole house sparkling clean and smelling great. My house has 245 lbs of dog, and after today, you would never know. After today, I am officially done self-cleaning my carpets! Thanks a million! !” – Keri A. We wanted to learn a little more about this award-winning carpet cleaning company and its superb online reputation, so we took a few minutes to talk with Brian Stuhlmiller, the owner of On the Spot Carpet & Upholstery Cleaning. Brian attributes On the Spot Carpet & Upholstery Cleaning’s strong online reputation to House Call Pro, which is an app they use that sends their clients an option to leave a review after the job has been completed. Outside of building a powerful online reputation, On the Spot Carpet & Upholstery Cleaning has gotten their name out there through Facebook advertising and word of mouth. Congratulations to the team at On the Spot Carpet & Upholstery Cleaning for being a 2019 Top Rated Local award winner, and thank you so much, Brian, for taking the time to speak with us! We highly recommend On the Spot Carpet & Upholstery Cleaning in Bismarck. Visit their website today! Top Rated Local® is pleased to announce that Coastal Carpet & Tile Cleaning is a 2019 award winner for carpet cleaners in Mississippi! If you are looking for trained professionals to support in any of your floor cleaning needs, with over 17 years of experience, Coastal Carpet & Tile Cleaning is the way to go in Gulfpoint, Mississippi. Coastal Carpet & Tile Cleaning has received dozens of reviews on verified sites with an average rating of 4.92 stars, earning them an incredible Rating Score™ of 93.20 and a 2019 Top Rated Local award for ranking among the top 10 carpet cleaners in all of Mississippi! “I am beyond pleased with the service that Coastal Carpet & Tile Cleaning (Robert and Chris) provided! They cleaned three of my bedrooms (all of which were upstairs) in less than an hour, and the carpets looked amazing! Besides the great cleaning job that they did, they provided great customer service over the phone, and were very polite and personable, which goes a long way nowadays! [I] highly recommend this company!” -LaToya B. We wanted to learn a little more about this award-winning business and its impressive online reputation, so we took a few minutes to talk with Robert Hokamp, the owner of Coastal Carpet & Tile Cleaning. “We clean Biloxi one floor at a time! 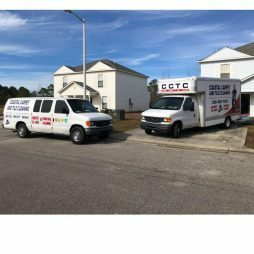 Outside of building a powerful online reputation, Coastal Carpet & Tile Cleaning has gotten their name out there through the Google platform, phone books, and some online advertising. Congratulations to the team at Coastal Carpet & Tile Cleaning for being a 2019 Top Rated Local award winner, and thank you so much, Robert, for taking the time to speak with us! Visit their website here! Top Rated Local® is pleased to announce that Great Day Carpet Cleaning is an award winner for carpet cleaners in 2019. For the cleanest carpets in Olive Branch, Mississippi, look no further than this award-winning company! Great Day Carpet Cleaning has received many overwhelmingly positive reviews across multiple verified sites with an average rating of 4.86 stars, earning them an impressive Rating Score™ of 92.58 and a 2019 Top Rated Local award for ranking as one of the top 10 carpet cleaners in Mississippi! “Great Day Carpet Cleaning is wonderful! They were punctual, friendly, and professional. They took extra care to protect our hardwood floors, used organic, safe products that would not harm our indoor pets, and did an exceptional job cleaning our carpets. We had a very large bicycle oil spill on our carpet, and he was able to remove it without harming the carpet. We highly recommend them! They were referred to us by a trusted real estate broker. I am keeping their number because they also clean rugs and upholstered furniture. After reading their Facebook page, I am especially impressed that they support Tunica Humane Society…” – D.S. It is because of excellent reviews like this that Great Day Carpet Cleaning is now able to call themselves a Top Rated Local award winner! We were excited to learn all about how Great Day Carpet Cleaning has been able to build such an impressive reputation, so we sat down with the owner, Eddie Day. The first thing we wanted to know was what it is that makes Great Day Carpet Cleaning stand apart from their local competitors. Eddie told us that his company is family-owned and -operated. He remembers being around the industry as a child when his father worked as a carpet cleaner. At that time, there was nobody else offering the kind of service they provide. Eddie went on to tell us that at Great Day Carpet Cleaning, they use only the highest quality equipment and solutions in the carpet cleaning industry. Great Day Carpet Cleaning has benefitted from their fantastic online reviews. Eddie says there’s no secret to it — when you do good work, people will feel compelled to go online and leave good reviews. Because of their exceptional service, word-of-mouth referrals have been their greatest source for new clients. Congratulations to Great Day Carpet Cleaning for being a 2019 Top Rated Local award winner, and special thanks to Eddie Dayfor taking the time to speak with us! 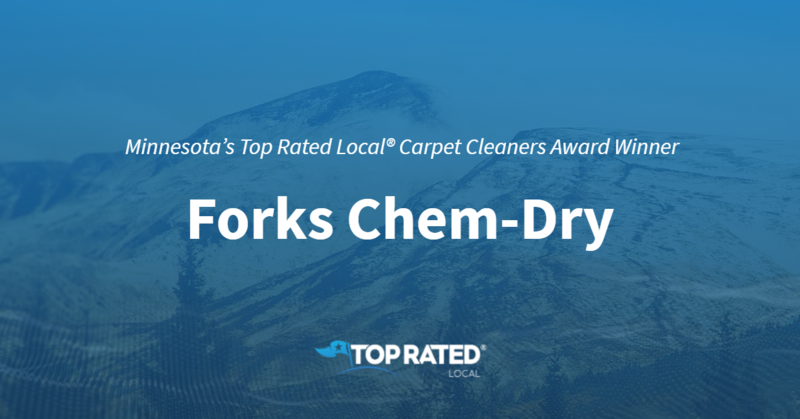 Top Rated Local® is pleased to announce that Forks Chem-Dry is an award winner for carpet cleaners in 2019. If you’re ready to have the cleanest carpets in East Grand Fork, Michigan, look no further than this award-winning company! Forks Chem-Dry has received many overwhelmingly positive reviews across multiple verified sites with an average rating of 5.00 stars, earning them an impressive Rating Score™ of 95.00 and a 2019 Top Rated Local award for ranking as one of the top 10 carpet cleaners in Minnesota! “[I] just had Forks Chem-Dry do a move-out carpet cleaning for our house and [I] was absolutely impressed. They were very professional, kind, and easy-going. I was amazed at how clean they got my carpets. They even got the stains out that had been in the house before we moved in. That was after another professional cleaning company could not [do it]. I had tried a few years ago. Chem-Dry got it completely out. They also got the putty that was in the downstairs carpet. My carpets looked better than they did when I first moved in. [I] would definitely recommend [them]!” -K.T. It is because of excellent reviews like this that Forks Chem-Dry is now able to call themselves a Top Rated Local award winner! 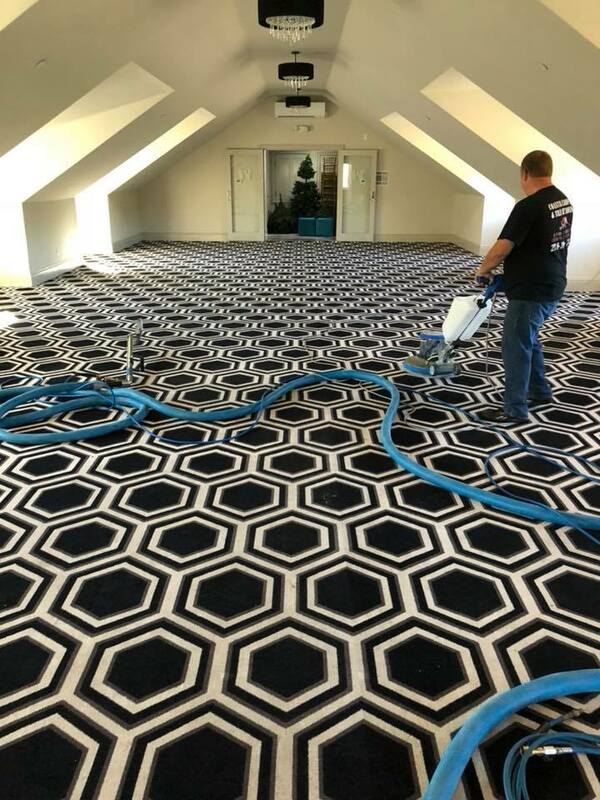 Forks Chem-Dry is the world’s largest carpet cleaning franchise, and has been in business since 1985 and have always been locally-owned and -operated. We were excited to learn all about how Forks Chem-Dry has been able to build such an impressive reputation, so we sat down with the owner, Brent Kemnitz. The first thing we wanted to know was what it is that makes Forks Chem-Dry stand apart from their local competitors. Brent shared with us that their company uses less moisture than anybody else, which means they keep their drying time to about two or three hours. They utilize over 100 green, natural, cleaning products. He says that because of the quality of products they use, they get more lifting power, which means it’s less likely to see a return of those troublesome stains. Brent told us that they get many reviews for pet urine removal. Because of the quality of their products, they get rid of the stains and smell rather than mask it. In addition to building a strong reputation through exceptional customer service and positive reviews, Forks Chem-Dry also utilizes social media platforms like Facebook, and by sending out emails to ensure that their customers have the most up-to-date information and coupons available. Offline, they advertise special offers at local pet-seminars. Congratulations to Forks Chem-Dry for being a 2019 Top Rated Local award winner, and special thanks to Brent for taking the time to speak with us! 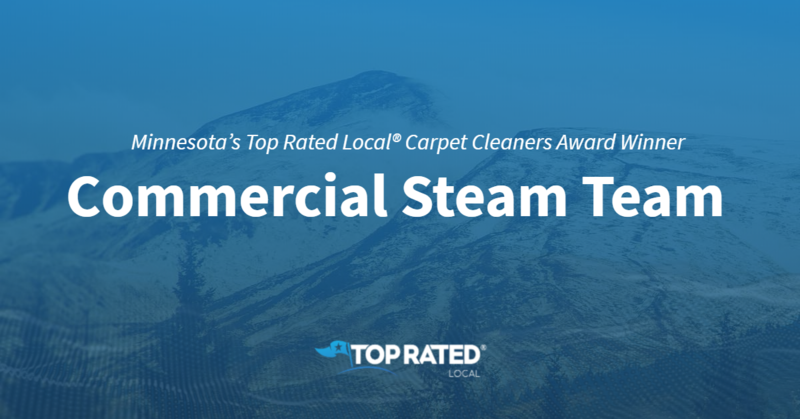 Top Rated Local® is pleased to announce that Commercial Steam Team is an award winner for carpet cleaners in 2019. If you are looking for a carpet cleaner that will get your stained and dull carpets to look better than ever, look no further than this award-winning company! 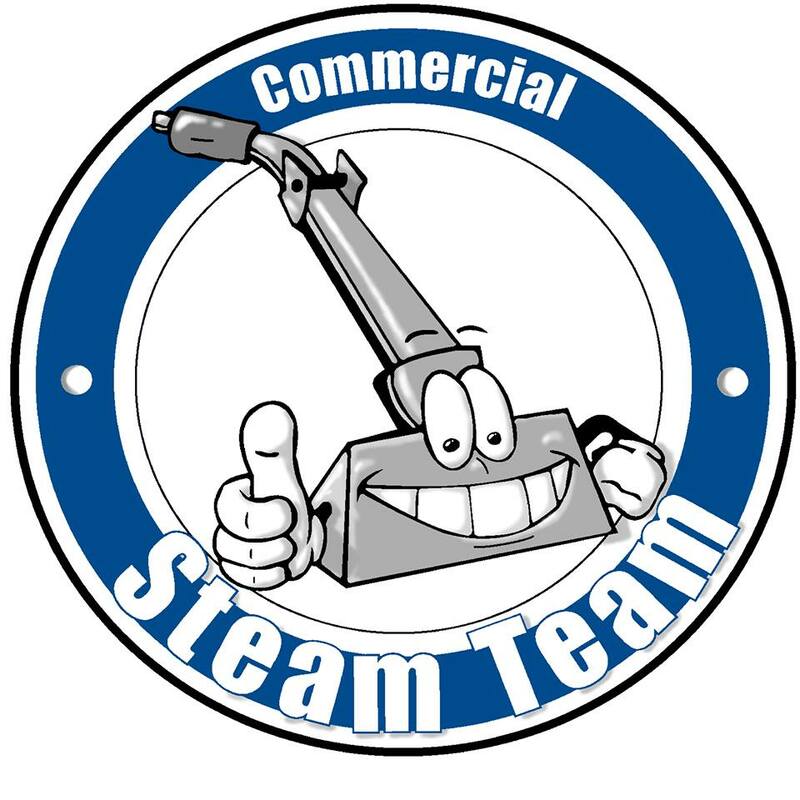 Commercial Steam Team has received many overwhelmingly positive reviews across four different verified sites with an average rating of 5.00 stars, earning them an impressive Rating Score™ of 99.00 and two 2019 Top Rated Local award for ranking as one of the top 100 businesses and one of the top three carpet cleaners in all of Minnesota! “I chose this company to ready my condo for sale because they are locally owned [and have] excellent reviews. They delivered as promised. The technicians were professional and focused on doing a great job, not on how fast they could get done and move on to the next stop. I highly recommend them for your carpet cleaning needs!” – M.G. It is because of excellent reviews like this that Commercial Steam Team is now able to call themselves a Top Rated Local award winner! Custom Steam Team is a local, family-owned business with 20+ years of experience in the cleaning industry. On their website, they boast that their team is dedicated to going above and beyond to complete every job using top-of-the-line equipment and nontoxic products. We were excited to learn all about how Commercial Steam Team has been able to build such an impressive reputation, so we sat down with the owner, Russ Zakariasen. Russ was very proud of his team, and through our chat, he referenced time and again how valuable having top-notch employees is for a business. According to Russ, it is Commercial Steam Team’s employees that make all the difference. Commercial Steam Team has hundreds of positive reviews that speak of the quality of the product and the quality of service provided. While Commercial Steam Team has found success through word-of-mouth referrals and great reviews, they have also marketed their business through some direct flyers as well as social media. “[They offered] competitive pricing, friendly service, [and] they showed up on time and did a great job of cleaning our carpet. They even followed up to make sure that we were happy with the job done. [They] far exceeded my expectations.” – R.O. Congratulations to Commercial Steam Team for being a 2019 Top Rated Local award winner, and special thanks to Russ for taking the time to speak with us! 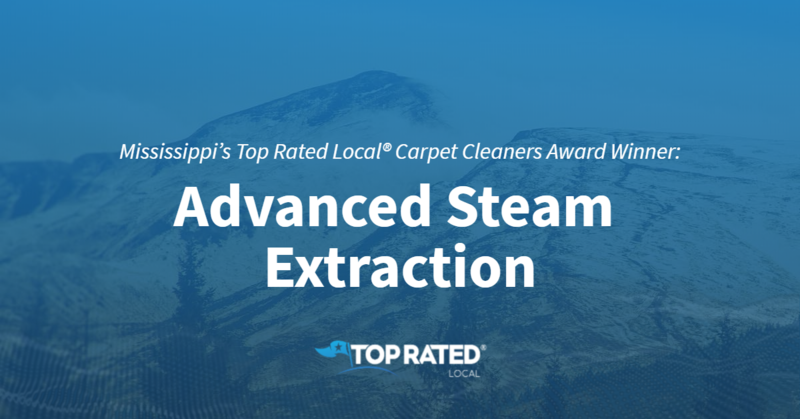 Top Rated Local® is pleased to announce that Advanced Steam Extraction is a 2019 award winner for carpet cleaners in Mississippi! When it comes to carpet cleaning in Pearl, no company beats Advanced Steam Extraction. Advanced Steam Extraction has received dozens of reviews on multiple verified sites with an average rating of 4.73 stars, earning them a phenomenal Rating Score™ of 91.33 and a 2019 Top Rated Local award for ranking among the top 10 carpet cleaners in all of Mississippi! “One of their crews spent a full day at my house, moving furniture to clean, strip and refinish virtually every floor in my house. They worked their tails off and I now have floors that look better than they did when new. Highly recommend them!” – Marty D.
Richie Lott, the owner of Advanced Steam Extraction, generously gave us a few minutes of his time to tell us a little more about his stand-out business and its outstanding online reputation. 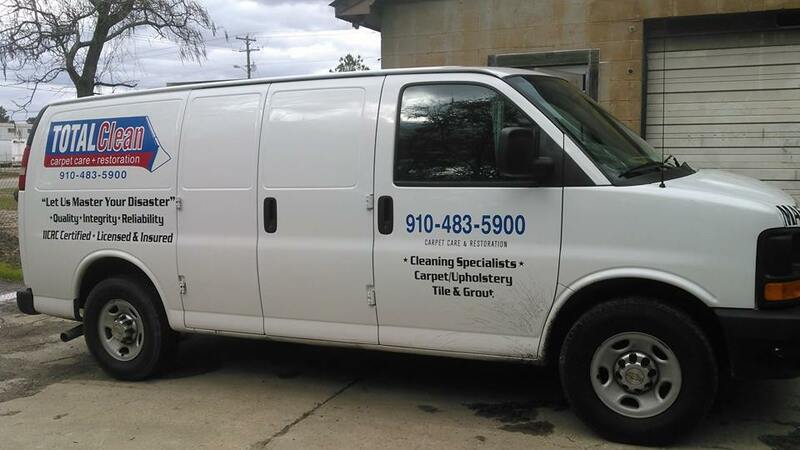 He also told us that they offer a variety of services besides just carpet cleaning, including rug cleaning; tile and grout cleaning; upholstery and drape cleaning; stone, marble and granite cleaning; leather cleaning and repair; water damage restoration; mold remediation; trauma clean-up and pressure washing. Outside of building a powerful online reputation, Advanced Steam Extraction has gotten their name out through word of mouth and social media. Congratulations to the team at Advanced Steam Extraction for being a 2019 Top Rated Local award winner, and thank you so much, Richie, for taking the time to speak with us! We highly recommend Advanced Steam Extraction for all of your carpet cleaning needs. Visit their website today! Top Rated Local® is pleased to announce that Twin Cities Finest is a 2019 award winner for carpet cleaners in Minnesota! Twin Cities Finest has received hundreds of reviews on five different verified sites with an average rating of 4.88 stars, earning them a near perfect Rating Score™ of 99.84 and a 2019 Top Rated Local award for ranking among the top 10 carpet cleaners in Minnesota. “Brian Greenquist came to our home today to clean our carpets. He was very professional and took his time explaining all the services, and then gave us a detailed quote. He did a fantastic job. 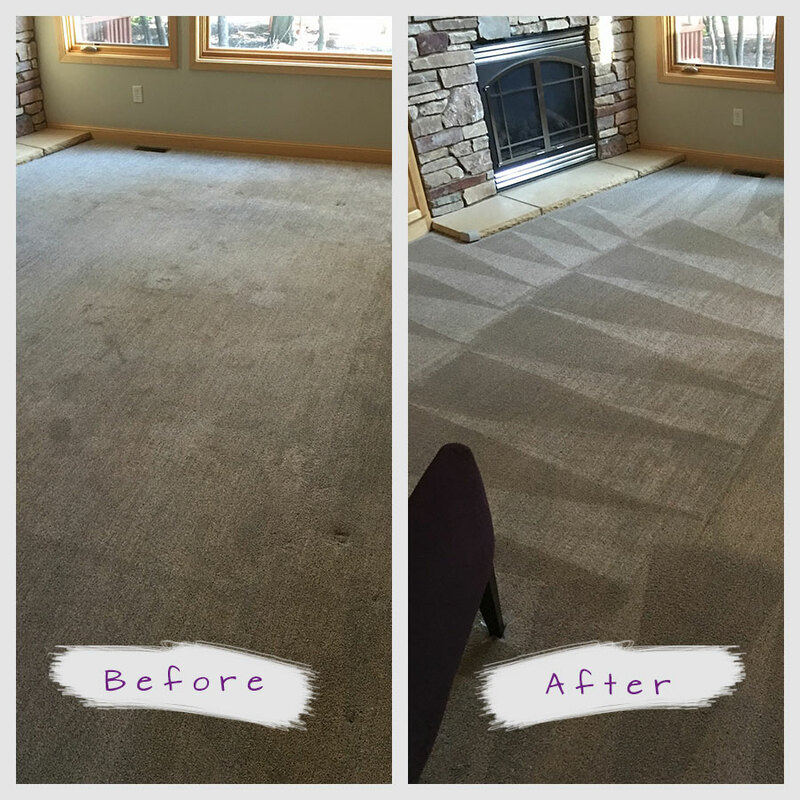 [I] cannot believe how clean the carpets are, and he used the new machine, the zipper, to do an extra deep cleaning since we have a cat….thank you!” -Patricia V.
In order to learn a little more about Twin Cities Finest, business owner, Brent, was gracious enough to give us a few minutes of his time. The first question we had for Brent was what sets Twin Cities Finest apart from the other carpet cleaners in Minnesota. He told us that they have the best equipment in town while also costing less than the average for their area. He also adds that they simply show up on time, are polite and communicate well. It is not difficult to understand, then, why they have come out on top. Brent credits Twin Cities Finest’s strong online reputation to the fact that they do genuine good work. Not only have they made an effort to create a strong website, but they will intentionally follow up with all clients via email. Additionally, they ask for complements, questions, and complaints in hopes of learning from that feedback. Congratulations to the team at Twin Cities Finest for being a 2019 Top Rated Local award winner, and thank you so much, Brent, for taking the time to speak with us! Visit their website here! 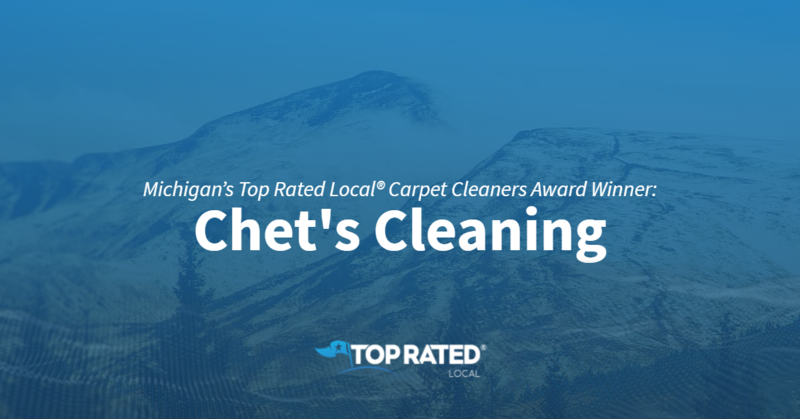 Top Rated Local® is pleased to announce that Chet’s Cleaning is a two-time 2019 award winner in Michigan! Is your carpeting in need of professional attention? If so, you won’t find a better carpet cleaning company to work with in Madison Heights than Chet’s Cleaning. Chet’s Cleaning has received hundreds of reviews on five verified sites with an average rating of 4.96 stars, earning them a fantastic Rating Score™ of 99.62 and two 2019 Top Rated Local awards — one for ranking among the top 100 businesses in Michigan and one for ranking among the top 10 carpet cleaners in Michigan! “I recently used Chet’s Cleaning, and from start to finish, I was and am 100-percent satisfied! First of all, they were professional, courteous and honest about realistic expectations. I had two couches cleaned, as well as several large wool rugs, drapes/curtains and basement carpeting. They removed the rugs and curtains to clean off-site…they had measured prior to their removal to ensure everything was put back exactly as they were. Chet personally re-hung and steamed the curtains. I have not seen this level of customer service in quite some time. And the workmanship? Amazing! Everything looks fantastic. I highly recommend Chet’s Cleaning and will be using them again in the future.” – Melissa L.
In order to learn a little more about this award-winning business and its outstanding online reputation, we took a few minutes to talk with Jennifer Carnaghi, Marketing Director at Chet’s Cleaning. “We are 100-percent referral-based, so we do relationship marketing. We look for other types of like-minded companies that are dedicated to customer service, and build a network of referrals. Congratulations to the team at Chet’s Cleaning for being a 2019 Top Rated Local award winner, and thank you so much, Jennifer, for taking the time to speak with us! For all of your carpet cleaning needs in Madison Heights, we highly recommend Chet’s Cleaning. Visit their website today!